Premium asset labels supplied with the best available universal powerful adhesive which will stick to most surfaces - both high surface energy (HSE) and low surface energy (LSE) plastics, powder coatings and slightly oily metal surfaces. These asset tags have high temperature resistance, up to 150ºC short term, and down to - 40ºC. Supplied in strips of 10 labels. Durable aluminium foil labels for id labels and asset tags suitable for both indoor and outdoor use.Aluminium foil labels give you a high performance asset labelling solution for extreme situations. High temperature resistance, up to 150ºC short term, and down to - 40ºC this label material can only be described as the most universal solution to suit most asset labelling requirements. These destructible tamper evident labels are suitable for use as security labels or asset stickers and come supplied with an universal, powerful adhesive which will bond to most surfaces. Impossible to remove in one piece and will break into small pieces if anyone tries to remove it thus protecting your property – a theft deterrent that also discourage unauthorised asset transfers. The strong, universal adhesive will bond to both most surfaces with high temperature resistance. Supplied on rolls. 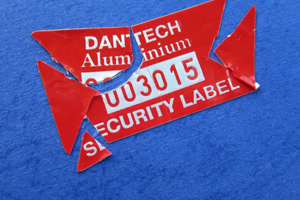 As well as tamper evident labels Dantech also provide tamper void labels. Protect important written information such as text/numbering/date with these self laminating labels or write and seal labels – once the overlay is applied any written data cannot be altered. Simply write your text and information on the write and seal label - then remove the backing paper on the clear adhesive overlay and press down firmly over the label to protect the written information against tampering, abrasion, grease and chemicals. Supplied in strips of 10 labels. 3 part asset tracking labels - place main label on asset and attach the smaller asset tracking labels to your records - simplifies record keeping and reduces the risk of handwritten errors and mistakes. For ultimate durability our asset tracking labels have a clear lamination to protect the printed image and are supplied in strips of 5. Identify and track equipment safely with these labels. High performance industrial adhesive suitable for most surfaces which will give high initial adhesion. Image cannot be ‘wiped off’ – permanently engraved into the surface. Laboratory and medical use: Surgical instruments, vials, tubes, slides. Safe in autoclave. Use for cameras, PDA’s, mobiles, handtools, musical instruments, which are handled continuously – text won’t come off! Available with bar code, inc. 2D DataMatrix code. Add £ 7.00 per 100 labels. Logo can be included at extra cost subject to sight of image. Scan & set up £50.00 plus add £7.00 per 100 labels. These plates are 0.3mm thick, photographically printed onto the aluminium with your name and sequential number/bar code - then anodised to seal in and totally protect the print from abrasion, chemicals and adverse weather conditions. 3M VHB industrial adhesive or use screws/rivets. Must be fixed to a flat surface. Black print only, one or two lines of text plus sequential bar code and readable number. Minimum Order 300 labels. Choice of two sizes plus sequential barcode including 2D DataMatrix code and readable number. The text and numbering is embedded in the aluminium and anodised on top to seal in and protect the image. In addition we recommend you include a warning message that the equipment is traceable by the police plus a contact telephone number to use if recovered or left behind in a taxi, hotel or train. The numbering also helps you register, keep track of and identify each Trakamarked item. Logo: £ 24.00 set up charge - one colour high resolution file required. an cost effective solution – same durable robust quality aluminium. The demand for more information especially in industry to trace components/materials and their origin led to a two dimensional matrix code which can contain 100’s of digits/letters being introduced some years ago - the traditional bar code will only hold 8-10 characters/digits. These codes are therefore used when a large amount of data is required. Aluminium plates and foils with precision printing, sequentially numbered bar codes, including 2D codes, sealed in the aluminium with a protective anodising to provide years of protection against heat, cold, chemicals and abrasion. Intensified image or Teflon® coating is available for extreme environments. Fixed with adhesive or mechanical fasteners through punched holes. Stainless steel plates gives extreme resistance to weather, corrosion and abrasion - they are also compulsory in certain food environments. Barcodes and data are fused onto a ceramic coating and will withstand temperatures up to 1000ºC and most chemicals. A better way to track small and large tools, instruments and equipment using an advanced bar code solution including sequential numbering and 2D DataMatrix codes.